How many calories in a Pomegranate? See below, the Pomegranate calories for the different serving sizes. We provide you with Pomegranate nutrition facts and the Pomegranate benefits to help you lose weight and eat a healthy diet. The Pomegranate is one of our favorite fruits, taking some perseverance to eat though. It’s grown on small deciduous trees. The fruit needs to be cut open, but inside small capsules of juice (arils) are revealed waiting to be prised away from its shell. The juice is delicious, but If the effort required is too much, pomegranate juice is generally available from the local store. Ayurveda is a system of traditional medicine from India – the Pomegranate has been used within the Ayurveda system in India for thousands of years, where the rind of the fruit and bark of the tree are used to treat stomach upsets, and the juice as a balance against a high fat diet being consumed. The juice is full of Vitamins C and B5 and is full of antioxidants. Other Pomegranate benefits are thought to include added protection against heart / cardiovascular disease and reduction in bad LDL cholesterol. Below are two calorie tables for eating the fruit when fresh and also drinking its juice. See our fruit calories comparison chart to compare the Pomegranate calories with the other calories in fruit. 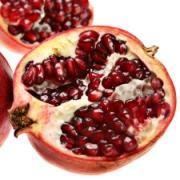 Read about Pomegranate nutrition in more detail. Also, have a look how nutritious Pomegranates are in comparison to the other fruit nutrition facts. All of our calorie information is provided by the US Department of Agriculture. * Based on samples of California Wonderful variety.